The word mig-raust in Catalan means half roasted. 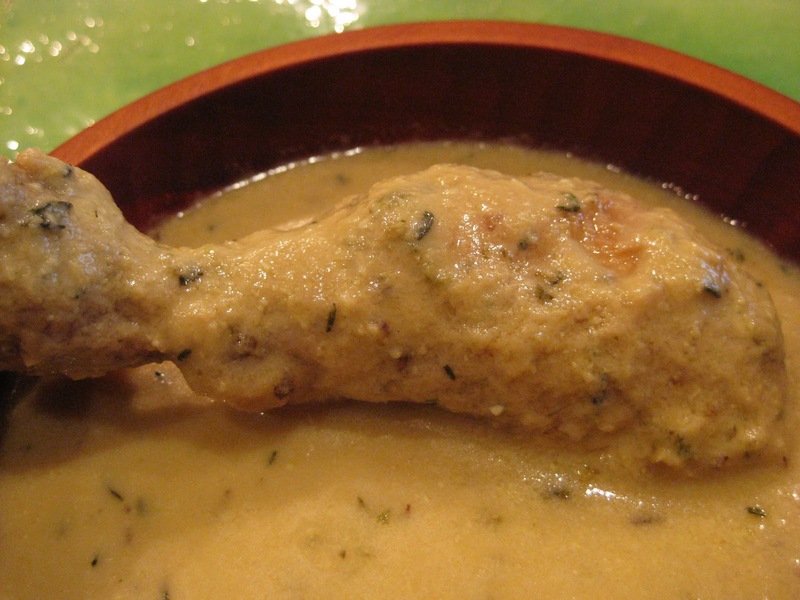 The method was typical of Catalan cooking used to prepare a large variety of fowl during the 15th C. Today this cooking method is disappearing. 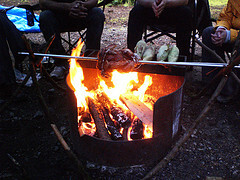 Put the bird on a spit, baste it with lard and roast until half cooked, about 20 minutes. In the worst of cases if a spit is not available roast it in the oven in a clay dish or roasting pan. Remove the bird from the heat and remove the apendiges. Cut the breast and back in half. Then quarter it. Put the parts into a clay casserole. Grind almonds in a food processor. Add broth to the almonds. When well ground strain the mixture throw cheesecloth into a saucepan. Add the seasoning and bring it to a boil over moderate heat. When the flavor of the seasoning is blended with the almond milk, pour this over the chicken. Add the bacon and boil gently over low heat. Depending on the size of the bird it should take about 20 minutes to finish cooking. Grind chicken livers in a food processor add the verjuice or vinegar. Mix well. Ten minutes before the chicken is done add the chicken liver mixture. Stir in sugar. Taste for sweet and sourness. Add more sugar if needed. Remove the cinnamon stick and crush. Spoon the chicken into soup bowls. Pour the sauce over this. Garnish with sugar and crushed cinnamon.